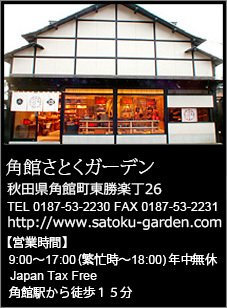 If you have any questions about this area, feel free to drop by our shop　Satoku Garden.. Language Assistance (Russian, English speaking staffs), Travel Guidance, Free Brochures, Tour guide maps and Tax Free shopping are available at Kakunodate Satoku Garden shop. 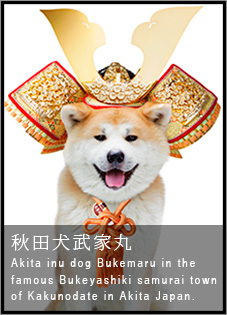 You can also enjoy photo shooting with our Akita Dog Bukemaru here. 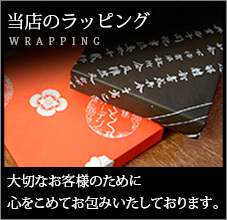 Located at the center of the Samurai Bukeyashiki Street in Kakunodate Akita prefecture, it is one of the highest quality souvenir shops in town; selling traditional cherry tree bark woodwork and local art. Guided tour in English for Main House Exploring at Aoyagi Samurai Manor Museum in Kakunodate Akita Japan. 有限会社さとくガーデン　〒014-0325 秋田県角館町東勝楽丁26　電話番号: 0187-53-2230　COPYRIGHT© SATOKU GARDEN. ALL RIGHTS RESERVED.